Amid preparations for his second summit with North Korean leader Kim Jong-Un, U.S. President Donald Trump is turning up the heat on Seoul by demanding it pay more for the 28,500 U.S. military personnel stationed in the South. Some Korea analysts say that U.S.’s leverage with Pyongyang, backed by severe sanctions, has been undermined by the aggressive appeasement policies of the leftist government of President Moon Jae-In in Seoul. China and North Korea, meanwhile, have worked continuously to splinter the critical Seoul-Tokyo-Washington strategic alliance. And South Korean conservatives, pointing to the U.S. military pullout from Syria, fear the Trump administration will withdraw U.S. forces from the South as part of a deal with North Korea. North Korea is using the tug-of-war between the U.S. and South Korea over sharing costs for U.S. 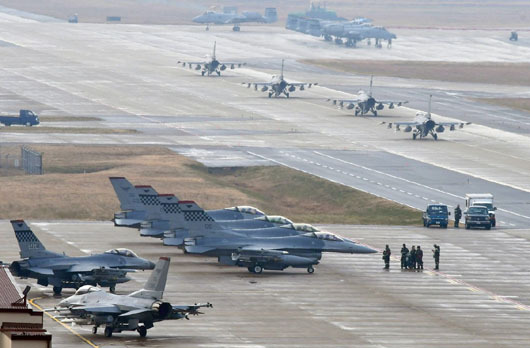 Forces Korea (USFK) “as leverage to strengthen its argument that the South should unite with the North to fight against foreign powers,” said David Maxwell, senior fellow for the Foundation of Defense Democracies. North Korea’s party mouthpiece Rodong Sinmun last week published an editorial titled “the intention behind the demand to increase defense costs,” where it said the U.S. is not treating the South as its ally. It said the U.S. is only pursuing its own interests while hampering the progress of peace talks between the two Koreas. U.S. Ambassador to South Korea Harry Harris visited Cheong Wa Dae in an apparent move to pressure Seoul on the issue, Seoul-based daily newspaper Dong-A Ilbo reported on Jan. 21. According to the report, Harris said Washington may consider “implementing the South Korea-U.S. Mutual Defense Treaty in a different way,” during a closed-door meeting with national security adviser Chung Eui-Yong. The U.S. Embassy in Seoul refused to comment on the matter.